Energy poverty, concept almost unknown until recently, even with different definitions, is increasingly often invoked and has become a permanent topic in several countries. Even if this concept takes into account mainly the poverty of residential consumers, it also affects the non-households. Fighting energy poverty has a synergic nature, energy efficiency, revenues of consumers, new technologies, the price of energy and its availability being the most important. They must be addressed unitarily and in a balanced manner. Neglecting some of them and emphasizing on others leads to apparently good results, but, in fact, they lead to a deeper poverty in the long run. Eurostat presents a map of the population below the poverty limit at EU level, which we consider to be similar as in the picture with energy poverty of EU’s population. Prices of electricity, gas and other fuels have continuously increased in the recent years, determining a higher energy poverty and increase in the number of vulnerable consumers. 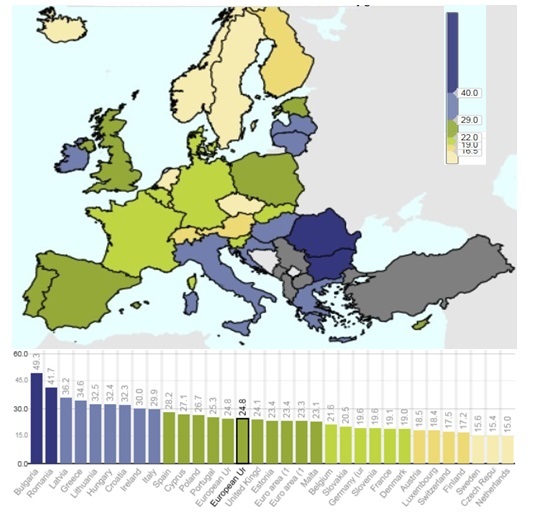 The subject matter of the opinion of the European Economic and Social Committee on energy poverty in the context of liberalization and economic crisis is not to determine the reasons of electricity price increase, but to highlight the need to protect vulnerable consumers, to avoid situations of energy poverty. Fighting against energy poverty must be a strategic priority, which must be addressed at all levels. The concept of energy poverty can be addressed at both macroeconomic and microeconomic levels. Access to electricity and gas in sufficient amounts and in conditions of quality for the industry, agriculture and remaining sectors is essential for the prosperity and competitiveness of a country. Its absence may lead to economic crises, unemployment and poverty in general. Energy poverty of residential consumers can be defined as the difficulty or incapacity to maintain proper conditions of temperature inside the home, as well as to uses other essential energy services at a reasonable price. Given the difficulties that persons with low incomes may face, we need to establish efficiency measures regarding energy consumption at consumers, reduce gas prices to end-consumers and financially support customers. The situation of energy poverty results from combining three main factors: the low level of revenues, energy consumption (efficiency) and energy prices. At EU level, the main cause of energy poverty is determined by the high level of gas and electricity prices. Thus, the high gas price is the reason for the existence of 50% of consumers considered vulnerable at EU level. This reason is followed by energy efficiency, which generates high consumption. The last place is held by the revenue of family members. In Romania, we believe the main cause of energy poverty is generated by high energy losses at the level of buildings, plus investment inefficiency and the inefficiency of using resources and energy equipment, with a share of 50%. Low revenues are the second reason and the gas price is the last one. Given these reasons, in order to really protect consumers, measures should be taken to diminish the primordial causes, so that the effect is really felt at consumer level. Streamlining and reducing gas consumption, corroborated with economic growth measures and, implicitly, the increase in consumers’ revenues would allow the reduction to more than half compared to the current situation of gas cost share in the familial budget. Energy poverty is not a phenomenon that can be easily measured, although it can be measured with variables such as incapacity to keep proper temperatures in houses (21% in EU27 according to Eurostat), the percentage of population with outstanding electricity bills (7% in EU27) or the number of homes with leaks, cracks or other problems affecting the building (18% in EU25, UE-SILC 2007 Study). According to the European Economic and Social Committee, most vulnerable social groups are those with the lowest revenues, such as people aged above 65, single parent families, persons affected by unemployment or those who benefit from social benefits. Moreover, in most cases, people with low incomes live in buildings with improper thermal insulation, which only worsens the energy poverty they face. The energy strategy must be conceived so as to provide the possibility to identify some concrete solutions to diminish energy poverty. I believe solutions against energy poverty should take precedence over energy independence concepts – an energy independent country, but poor (energetically, is a country with important vulnerabilities.